I was talking someone through some influence strategy recently and they posed the question - "If there was a Chief Influence Officer in a large organisation what would they do?" While I'm not arguing that organisations should be rolling everything up into one role the question did get me thinking about the key challenges that we most often see within large organisations when they are trying to influence individuals. These individuals could be clients, sit within other external organisations or be internal to their own organisation. The key responsibilities for a notional Chief Influence Officer (ChInfO) taking the lead on this would sit across many of the functional departments within a large organisation. 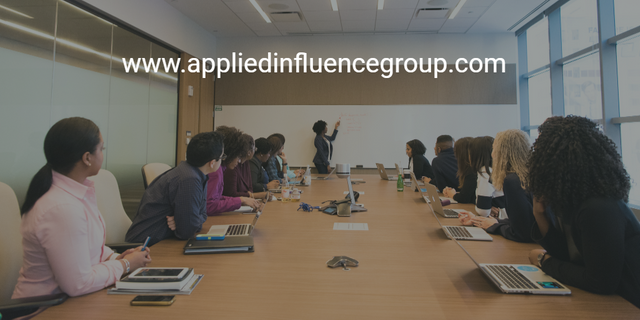 If influence is the ability to effect change in thoughts, emotions and actions then the overall responsibility of the Chief Influence Officer would be making sure that this was being done cohesively, effectively and comprehensively. At the highest level this means that in every area that people are being understood fully and communicated with effectively so that the message that is delivered to them is the one that makes the most sense to them. Internally, the ChInfO would take the lead on ensuring that strong influence skills are developed across the workforce. As AI, automation and digitisation increasingly impact on roles where technical competence has previously set organisations apart, the ability to effectively influence, both within and outside of the organisation will become a key differentiator. The ChInfO would be highly involved in helping to create the conditions for a culture where individual's desires and fears are catered for when the organisation makes decisions. Whether this is looking at how incentive schemes need to be adapted to individual preferences, or at facilitating decision making processes that allow for diversity of thought and feeling. Someone once described a group of people to me as fostering 'aggressive co-operation'. By this they meant that co-operation was highly valued, aggressively pursued and organisational barriers were adapted if they prevented co-operation. I think the ChInfO would be actively trying to do this. For an organisation to effectively wield combined influence it needs to be aggressively co-operating internally. Leveraging all the information within the organisation so that the sales team best understands who within their own organisation has existing influence with a client and where, within a client organisation influence sits. It's our observation that even within sales teams this information is often poorly shared and time is not freed up to consider this. Ensuring that use is made of existing touchpoints with a client to both understand the client's requirements best and to deliver appropriate messages at the right time. We regularly see organisations who have their own people embedded in existing deliveries with a client and don't use these embedded staff to help the sales teams win new business. Developing specific skills around eliciting client requirements and active listening. These all tie back into understanding the client but can also be critical in resolving differences. We frequently hear about misinterpretations regarding client issues. Effective elicitation can get to the bottom of this. Understood the informal networks that actually impact on change rather than the formal hierarchies that are often relied on. Identifying blockers and helping to influence them positively can rapidly increase the pace of change. Similarly, identifying those who are actively interested in accelerating change, regardless of position, and leveraging them can also build momentum. Understood the specific desires and fears that are impacted by the change. This is trying to marry up the business case with the personal agendas of those concerned. Enabled its people to deal with the emotional pressures of changes. This may involve upskilling some people in areas of emotional management whilst helping others become more self-aware of the stresses the change is placing on them. Help the senior leadership team understand their own influence styles and where their personal gaps are. Help other C-Suite leaders understand how their own desires and fears impact on both their decision making and the people who work for them. Ensure that influence is considered at the senior decision making level and that the impacts on the organisation's ability to influence (internally, externally and with clients) is factored into these decisions. As an example, it is far easier to influence people face-to-face than it is remotely. Business decisions around digitisation and/or reducing travel costs may encourage the business to move away from face-to-face interactions. Getting the business to recognise the cost to influence of not seeing people face-to-face at the right time would be something the ChInfO would be highlighting. Influence pervades virtually every aspect of a business but yet is often not considered at the right level. The suggestions I've made above are just some of the areas that someone purely focused on influence would be responsible for. We'd be interested in hearing what else you think a ChInfO would do.